‚Coconut Time’ is a term used by Pacific Islanders to describe their relaxed life-style: ‘Time has come when the coconut falls’ This music is out to reflect that attitude. Most of the songs were written by Marcator during a longer stay on Fiji in 2005. Additional titles were created in Vietnam and Indonesia but also at home in Germany. 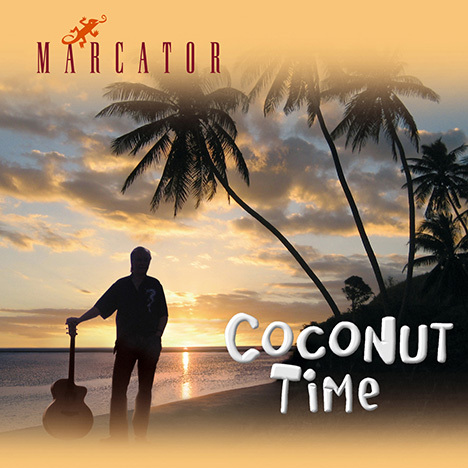 Compared to previous projects ‘Coconut Time’ is explicitly a solo album with Marcator playing all the instruments. The only guest soloist is Horst Lubitz aka John Mc Lou, a veteran horn player who accompanied every big star from Frank Sinatra, Eartha Kitt to Leonard Bernstein, on saxophones and flute. ‘Coconut Time’ is primarily a guitar album. Marcator plays about 20 different guitars to present the enormous variety and flexibility of the instrument. Of course slide (or Hawaiian) guitars play a major role in this context and wooden and metal dobros (resonator guitars) are used for this sound as well as 12-string Rickenbacker and old Danelectro instruments. Another important effect is the e-bow which can create the sound of a violin. Electric sitar and baritone guitar can also be heard while keyboards only play a supporting role. The simple motto of this album is: Relax! Have a good time!